I was so going to write a flame about the placement of the tabs after looking at those screenshots, but I am much happier now that I've read the full article. I was so happy to see the tabs to be moved by default to a sensible position, but after reading the full article I have to write a flame. Why is KDE keeping this utterly nonsense setting as a default? Almost every other app (including Konq!) have the tabs on top, and users have come to expect the tabs being on top. Having them below the thing they are switching is confusing to a new user of the application. Well, one reason for doing so could be Fitt's Law, which has things to say (amongst other things) about why pixels closer to the screen's edge are easier to hit with the mouse. Since Konsole has no status bar, the bottom edge of the window lacks anything to click, and as such it might as well be used for switching between views. This is just me hypothesising, of course, i have not spoken with anyone about it. I do not know where the tabs should be. But on the bottom, it makes sense for terminals. 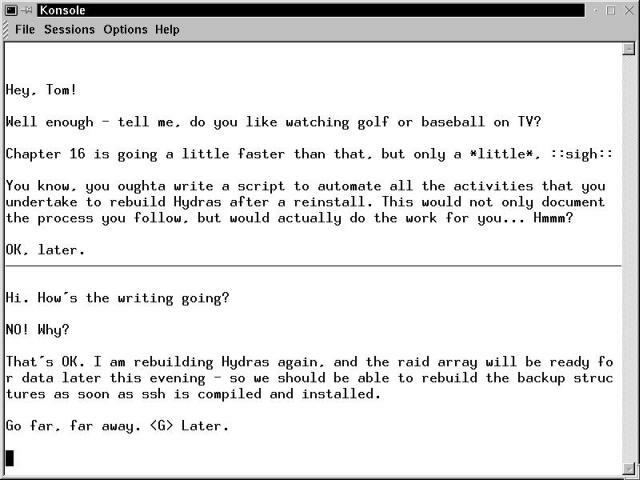 In a terminal, most of the time, you are working right at the bottom, since this is where you type new commands and where the commands outputs arise. I use Konsole a lot, and everything that happens is at the bottom of it: the last line you type in the terminal, and switching tabs. I seldom use the menu, and everything which is located at the top of the terminal window is stuff I typed some time ago (ie: my history), which I also seldom want to access. So by having the tabs at the bottom, all the action in a terminal is happening in the bottom part of the window, and the rarely used stuff is "stored" in the top part of the window. In Konqueror, the tabs are in the top part because the stuff you do with it involve: using the menu (more often than in a terminal), typing something in the adress bar, clicking on an icon in your toolbar, or a link in your bookmarks toolbar, which are all elements located at the top of the window. So this is where the tabs should go as well. Even though my eyes might be on the bottom, my mouse is on top of the window, where it mostly is. I am used to go to the top to scroll tabs, like in Konqueror, so I prefer it the same in Konsole. But hey, it's configurable, I don't really care for the default in this case as I think neither one is really worse. you use a mouse for changing tabs? I just set konsole to use ctrl-, and ctrl-. like all my other tabbed programs. 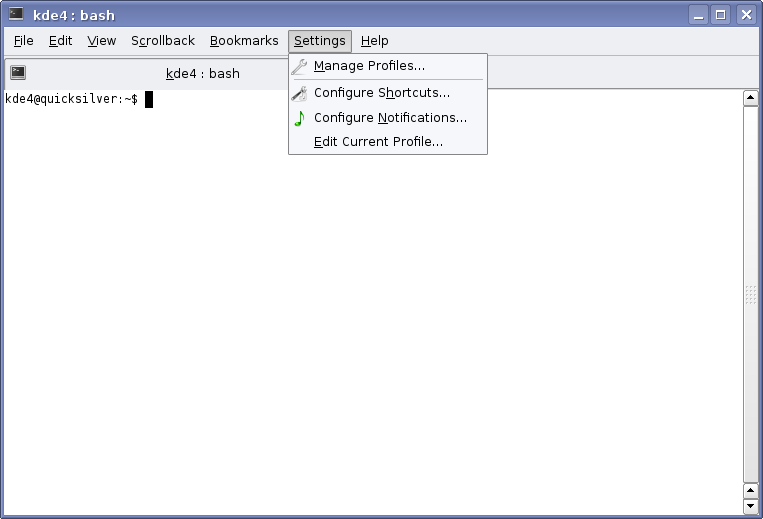 btw, konsole has default shortcuts shift+cursor keys to cycle through tabs (and shift+ctrl+cursor keys to move them). I totally agree with you on this one! It absolutely makes sence to have it at the bottom(for me at least), your eyes will be there when you're working and so it's easier to switch them. Note that by this logic, tabs should be also at the bottom for web browsers: usually you change tab when you're finished reading a webpage..
Bah, it doesn't really matter as it's easy to change..
> to a new user of the application. Most of the time when working in the terminal, your eyes are at the bottom of the screen reading the most recent output. It therefore makes sense to place the tabs there as well so that it isn't necessary to shift your gaze up and down the screen continually. The same logic applies to Kopete where new messages appear at the bottom of the window. A web page however is different since the most interesting content, which means new articles, news, product information etc. appears at the top of the screen. Power users will have their bookmarks there as well. In that case it makes sense to put the tabs at the top, as Konqueror/Firefox/Internet Explorer do. I can understand why it might seem conceptually better to have every application's tabs work the same way, but it doesn't take into account differences in how users work with those applications. I think Konsole is a thing where you have your eyes usually on the last lines of the output and the very last line very you enter your command (Unlike a Web-Browser, etc..). So basically having the tabs near that area makes sense to me and i like it that way. proving that the ability to change settings is a good thing. I use the keys to navigate through tabs as well but if I don't like where they are located, I just *change* their position. I mean the author *did* spend a lot of time asking us where to put them *and* how the settings and configuration screens should work! I say "STOP CRYING AND USE THE TOOLS KONSOLE GIVES YOU... PUT THEM WHERE YOU LIKE"! Really looking forward for the first Beta release. Once again, great job Troy! Could you please fix the first and third screenshot? The first one says "The requested URL /dannya/vol14_1x_konsole.png was not found on this server." when clicked, and the third one links to the second one (vol14_356_konsole.png). I did the survey even if I'm not an active Konsole user - I prefer more 'lightweighted' terminals (I do use Yakuake for irssi though). But it's always fun when you can make your voice heard and help supporting KDE. True transparency for 4.0 has been coded, however it is currently disabled by default as it breaks on machines that do not have proper composite support. This seems to be an issue encountered by quite a number of programs, with each program having to independently implement tests for composite support. Perhaps something should get factored into a library so that this problem goes away. About the broken links - Danny will probably have to fix them as I do not have editor access to dot content. I'm just submitting my articles using the contribute link on the side. Found the reason for one of the broken links: it needs a .jpg extension instead of dot .png. Still not certain of the other one. KDE 3 + compiz = Yakuake + true transparency ;). You can have it right here right now! (I also love the effect, especially cool with a video window in the background :)) Would love to see the compiz coolness reimplemented in a compositing version of KWin :). You have your wish. 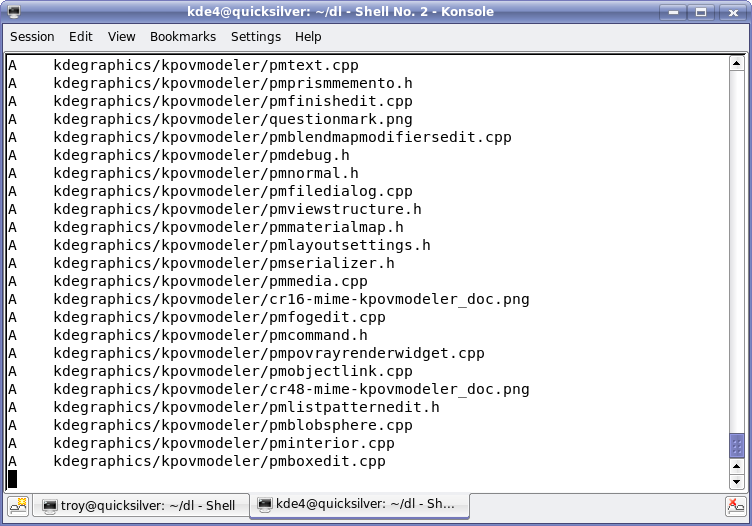 This is already implemented in KWin for KDE 4. I have an article in progress on this topic. Mistake: in the title blurb, it should read KDE 1.0, not 2.0. I have it correct in the body. This should probably be corrected before other sites start to pick up the header. My fault, sorry. Please, could you check and fix the links (on the images). Some are not working (404) and some leads to the wrong pictures :( . And just to clarify the importance of these to your "real users": All of these make it considerably simpler and more consistent to handle hardware, multimedia, PIM and data respectively. So, it is all stuff that works behind the scenes, but that does not mean it's not good for "real users". I am waiting to see some USEFUL eyecandy being implemented, for the benefit of real users :P. Per-window settable transparency, compizey Alt+Tab switcher, and MacOS-Expose-alike feature - those are things I would like to see in compositing KWin! 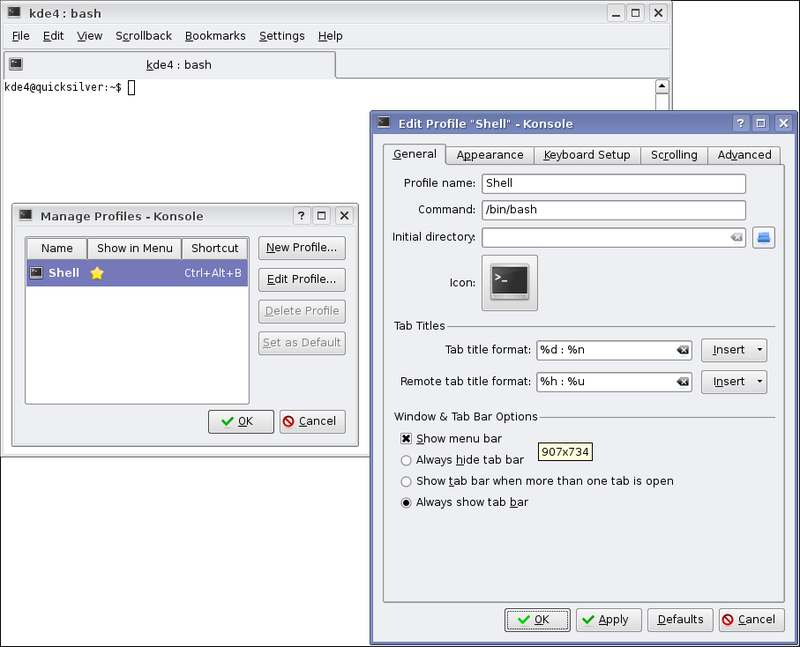 ... is already available in KDE 3.5.6, and has been for several microversions at least. Admittedly, the UI could be made rather more intuitive, but it works, at least for those using a good composite-active xorg and xorg graphics driver. 1. Make sure your xorg graphics driver has composite support and that you have composite turned on in your xorg.conf. 2. 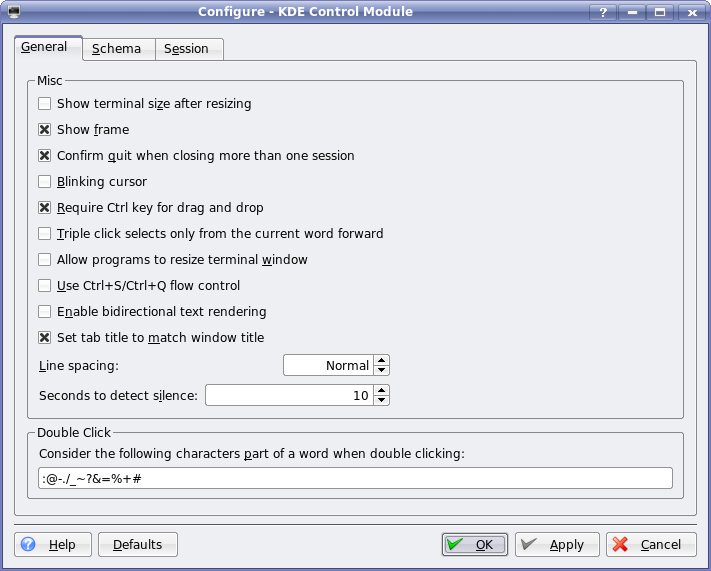 In the kcontrol Window behavior applet, on the Translucency tab, activate the Use translucency and shadows checkbox and OK thru the warning if you get one. On the Opacity sub-tab, set your system-wide translucency default levels for the various window types (Active, Inactive, Moving, Dock, and the "keep above" as active checkbox). OK out and restart KDE if necessary (from my experience, it appears if it starts with translucency enabled you can turn it on and off as desired, but if it starts off, you have to restart KDE to turn it on). 4. In the window menu for each window, there's an Opacity option. If you want a specific window set to something other than the system or window class defaults, set this. Since this is for a specific window, unlike the general system-wide and window class defaults, it applies only as long as the window exists. It also appears to apply to the /active/ state only, since the window is by definition activated (at least with the settings I have here) when you activate its menu, so it's the active window settings that apply and are adjusted. Unfortunately, I know of no way to set inactive window transparency for a specific window, only at the system and window class levels. Still, the window class settings are likely to suffice in most cases. BTW, there are still occasional bugs where KWin apparently gets mixed up and forgets to set a specific window to its usual state. I most often see this when a window says at "inactive" transparency even after it has been activated. Opening the window menu and clicking on the button under Opacity returns it to the usual defaults, thus fixing the transparency issue for that window temporarily. I don't have to do this often, but it does happen occasionally. So yes, there's definitely per-window transparency available in current KDE, with active/moving/inactive defaults configurable at the system level, active/inactive defaults for specific window classes configurable as exceptions, and individual active window settings configurable as exceptions to the class or system defaults. This isn't useful, but eyecandy. I know it's in there now, but it's "fake" transparency. It just shows the background, no matter what. It also repaints a bit slow when moving the konsole window. 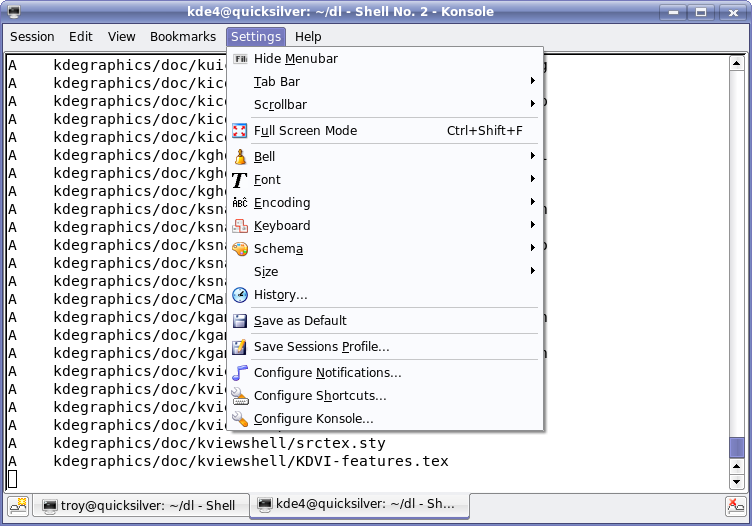 Real transparency is available in Konsole for KDE 4.0, it will require a desktop which supports transparency ( eg. Compiz or KDE 4's KWin ). Currently disabled until I fix some problems on desktops which don't support it. 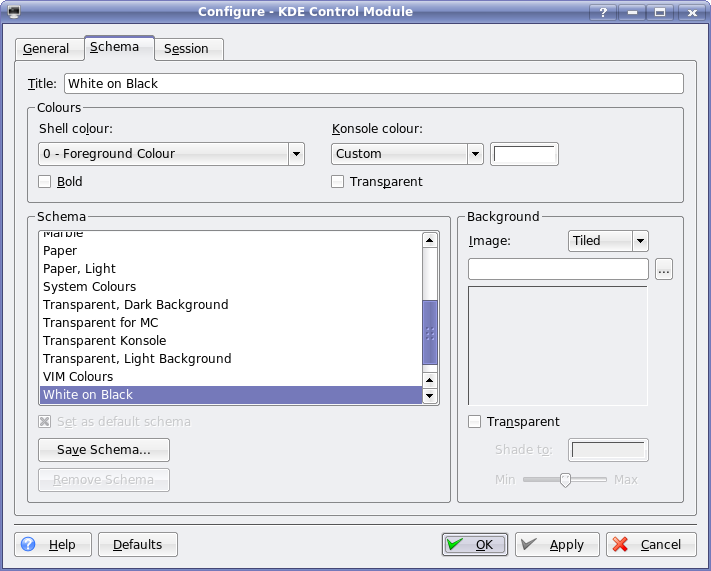 KDE 3's fake transparency and image backgrounds are not included. 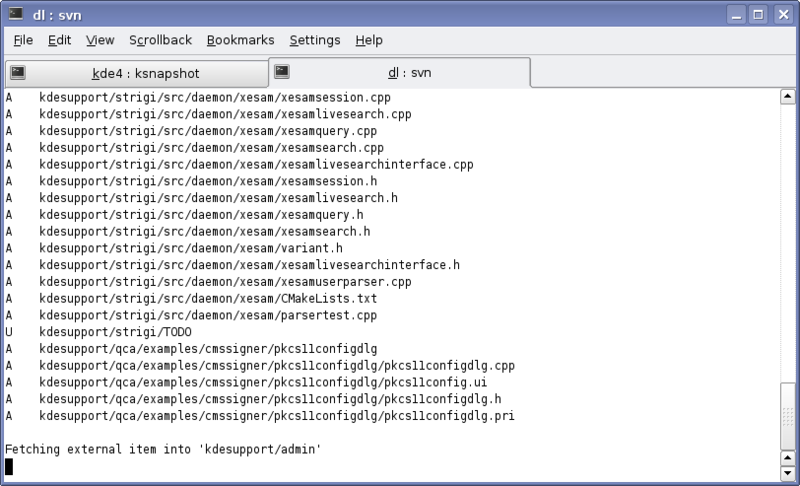 Additionally proper transparency is available in KDE 3.5.7 via a command-line argument ( --real-tranparency ) when starting Konsole, though that again causes glitches if enabled on desktops that don't support transparency. > KDE 3's fake transparency and image backgrounds are not included. Does this mean I can't use my favorite paper background ? I wonder if it would be possible to implement (an optional) support for commandline use of kioslaves before implementing the tea feature? Re: Making tea and kio-slaves..
How about integration by konsole sniffing for addresses from shell prompt and redirecting them transparenntly to kioexec? how should this handle "wget http:\\dot.kde.org" ? However, why is this still in kdenonbeta? Why isn't it in, for example, extragear? fuse_kio: fuse_opt.c:67: fuse_opt_insert_arg: Assertion `pos <= args->argc' failed. Will everything still be configurable in the popup menu when the menu bar is hidden? I find it useful. I don't think it is a good idea to put Encoding setting in some configuration dialog. 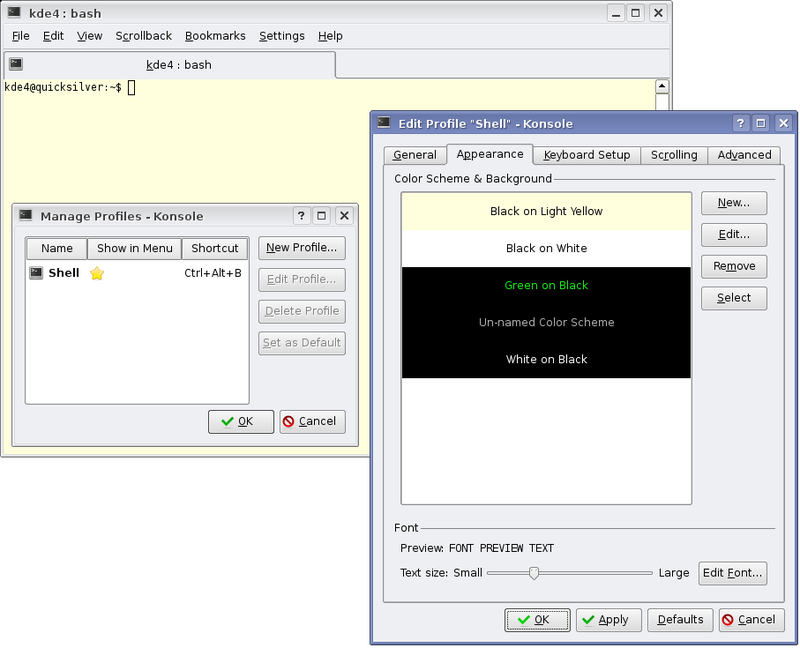 I use it frequently and it is also in the menu in Kate and katepart based applications.